Man on a Balcony, completed the same year that Albert Gleizes co-authored an important book on Cubism with his colleague Jean Metzinger, is an open declaration of the principles of Cubist painting. The composition demonstrates the Cubist style of broken lines and fractured planes as applied to the traditional format of the full-length portrait. However, the painting is sufficiently representational to allow the tall, elegantly posed figure to be identified as Dr. Théo Morinaud. The setting, a complex urban backdrop of smokestacks, train tracks, and bridge girders, is the view from the balcony of the dental surgeon's office on the avenue de l'Opéra in Paris. Man on a Balcony, completed the same year that Gleizes co-authored an important book on Cubism with his colleague Jean Metzinger, is an open declaration of the principles of Cubist painting. The composition demonstrates the Cubist style of broken lines and fractured planes as applied to the traditional format of the full-length portrait. Gleizes's rendering of the tall, elegantly posed man leaning gracefully against a balustrade dominates the foreground of the painting, where the figure inhabits a readable space bathed in natural light. Competing with this monumental, three-dimensional presence is the pattern of perpendicular lines and scalloped arcs that produce a virtual diagram of the man's body. The painting is sufficiently representational to allow the contemplative figure to be identified as Dr. Théo Morinaud, a dental surgeon in Paris. The setting, a complex urban backdrop of smokestacks, train tracks, and bridge girders, was the view from the balcony of his office on the avenue de l'Opéra. The large size of the painting reflects Gleizes's ambition to show it in the annual salon exhibitions in Paris, where he hoped to bring Cubism to wider audiences. Michael R. Taylor, from Masterpieces from the Philadelphia Museum of Art: Impressionism and Modern Art (2007), p. 126. Man on a Balcony is an open declaration of the principles of Cubist painting. It was completed the same year that Gleizes co-authored a book on Cubism with the painter Jean Metzinger. The composition demonstrates the Cubist style of broken lines and fractured planes as applied to a traditional format of painting. 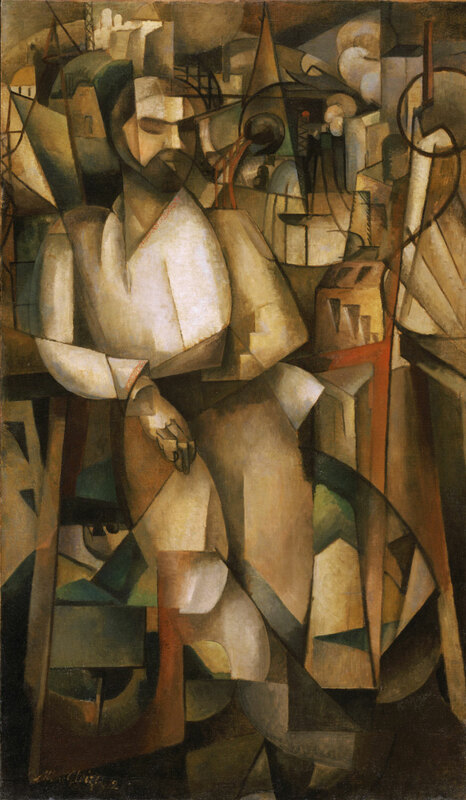 Gleizes's rendering of the tall, elegantly posed man leaning gracefully against a balustrade dominates the foreground of the painting, where the figure inhabits a readable space bathed in natural light. Competing with this monumental, three-dimensional presence is the pattern of perpendicular lines and scalloped arcs that produce a virtual diagram of the angles of the man's body and anatomy. This structure evolves into a complicated cityscape of clouds, windows, chimneys, train tracks, and bridges behind the contemplative figure. Suggestive of the air, the space, and even the passage of time between these places are bubblelike shapes that emanate from the man to the animated urban panorama behind him. Gleizes's vocabulary becomes more experimental as he captures the cacophony and simultaneity of modern city life using a vocabulary of abbreviated, invented signs. The gray, ocher, beige, and brown colors, often identified with the rigor of Cubist thought, suggest the grimy, smoky city atmosphere, although Gleizes has enlivened this neutral palette by including bright greens and reds as well as creamy white highlights. The large size of the painting contrasts with the intimately scaled Cubist works of Picasso and Braque, reflecting the destination Gleizes envisioned for his work: the public salons of Paris, where he exhibited in the hope of bringing Cubism to wider audiences. Twentieth Century Painting and Sculpture in the Philadelphia Museum of Art (2000), p. 33.